In the radioactive Dead Zone surrounding Chernobyl's Reactor a community of old women cling to their ancestral homeland. While their neighbours have long since fled and their husbands gradually died off, this sisterhood of women labour to cultivate land deemed uninhabitable. Ignoring government orders and health warnings, the 'Babushkas of Chernobyl' continue to forge an existence in one of the most toxic environments on earth. "People always ask me: aren't you afraid of radiation? - I ain't afraid of anything darling", grins Maria toothlessly. At 80 years old, her entire family has either died or moved away, and she lives alone in the heart of the Chernobyl Exclusion Zone. And yet she is happy. "This is all mine.. .all mine!" she exclaims, gesturing to her deserted surroundings, "thank god I returned home to my Motherland". There are approximately 100 returnees like Maria who live inside the exclusion zone, almost all of them are women. Having been evacuated after the reactor explosion, these Babushkas trekked up to 70 kilometres to illegally return home, climbing through bushes and digging under barbed wire. "When I came back I knelt down, grabbed a handful of soil, put it in my mouth and said 'I will never leave here again'", recounts Maria tearfully. Cut off from the rest of society and with their husbands long dead, the elderly Babushkas are now an almost entirely self-sufficient community, fishing and farming on some of the most toxic land on earth. Having survived together through the famines of Stalin and the brutality of the Second World War, these women are inextricably bonded to one another and to their land. "I won't go anywhere... even at gun point", explains Valentyna defiantly. "We've been friends forever", grins Hanna. The authorities have permitted the Babushka's to remain in their homes as it is thought they will die of old age before any radiation can take its toll. ​"They're so committed to their homeland even though its contaminated...it's amazing"​​, remarks one scientist. 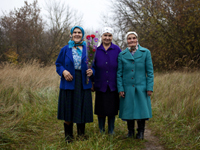 Surviving off homegrown crops and moonshine, the Babushkas are living out their days defiantly, and happily, in a region unperturbed by modern civilization. As Maria explains, "I don't regret anything, I'm still so happy that I'm in my own house and I'm not dependent on anyone... every person should live where their soul desires." 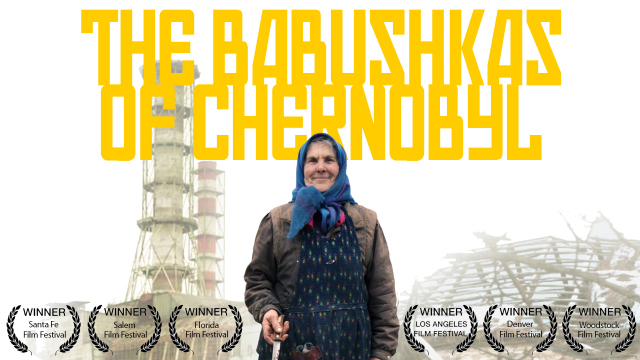 Compelling and surprisingly uplifting, The Babushkas of Chernobyl is a moving portrait of three unlikely heroines; a testament to the strength of solidarity and friendship. The New York Times Women In The World feature. Holly Morris (Director, Producer) makes films that explore the lives of risk-taking, contemporary women around the globe. Her award-winning & widely syndicated journalism on the Babushkas of Chernobyl (2011), also published as A Country of Women, and The Women Living in Chernobyl's Toxic Wasteland and The Best Travel Writing; Travelers Tales reported on the women of the Zone and is also the subject of her popular TED Talk. 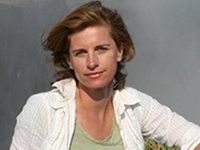 She’s the author of Adventure Divas: Searching the Globe for a New Kind of Heroine (Random House), a New York Times Notable book about exploration. Morris has filmed in more than 20 countries, and is a longtime presenter for the PBS series Globe Trekker. Holly Morris first went to Chernobyl in 2010 to cover the 25th anniversary of the accident for a travel program. She spent 2 days filming at Chernobyl Power Plant’s Reactor #4 and in the ghost city of Pripyat. Holly returned 2 months later for MORE magazine, to write her award-winning essay, and widely syndicated (The London Daily Telegraph, the Independent, The Week, CNN.com) essay “The Babushkas of Chernobyl” (also published as Ukraine: A Country of Women. ), which is the subject of this film and also of Morris' TED Talk on the women of Chernobyl's Dead Zone which received over a million views. She became fascinated with this community of approximately 100 returnees. Clearly there was a deeper story around these fierce, independent older women, and their ability to survive under such extraordinary, toxic conditions.